Undergraduate clinical research involving voice biomarker data collection at the University of Washington studying various neuropsychiatric conditions including Depression, Bipolar Disorder, Schizophrenia/Psychosis, Alzheimer’s, Parkinson’s, Amyotrophic Lateral Sclerosis (ALS), Multiple Sclerosis (MS), Borderline Personality Disorder, Anxiety, Stroke, Traumatic Brain Injury (TBI), Post-Traumatic Stress Disorder (PTSD), and Autism, with data analytic support from Neurolex Laboratories. Please use the link to the right to participate or share with anyone you think may be interested. 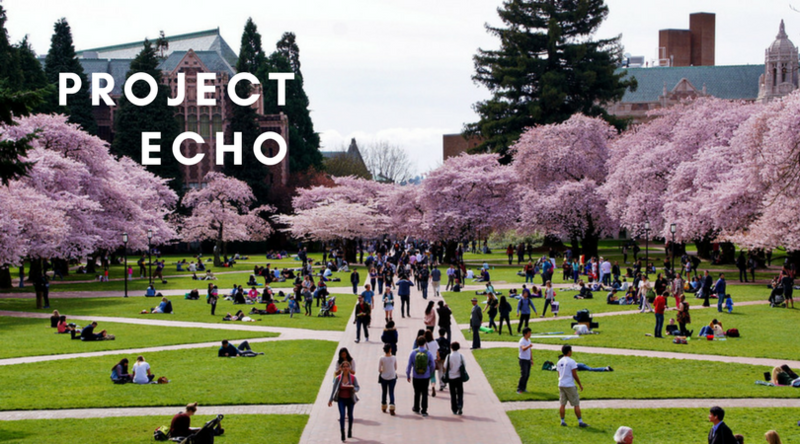 Project Echo got a chance to present what they have learned through their research experiences to a larger audience at the University of Washington Undergraduate Research Symposium. Click here to view the findings from our study. As the lead investigator for Project Echo, Dr. Reza Hosseini Ghomi was able to study and develop different methods for creating a multi-disciplinary experience for undergraduates to participate in. This offered students an experience in practical, hands-on research experience that would help increase the likelihood for entering into future STEM research careers. To read more about the findings of this study, click here. ​Learn more about CREATIV Lab Studies and how to participate here! CREATIV Lab focuses on personalized interventions that are designed to improve the mental health and well-being of people around the world as quickly and easily as possible. They draw upon the latest advances in neuroscience, technology and psychological science to develop targeted and streamlined behavioral interventions that any clinician can provide and that are readily available to a broad array of patients. The Lab is led by Patricia Areán, an international expert in developing psycho-social treatments that are robust and easy to disseminate in diverse health care settings. Dr. Areán is an outstanding ally in our work to improve health and we thank her for her support. CREATIV Lab provides crucial depression data to fuel our work in studying voice as a biomarker for depression. ​Participate by taking the Mental Health America depression screening questionnaire here! In partnership with Ozyegin University's Speech Processing Lab, our collaboration utilizes voice and survey data gathered with the help of Mental Health America and their national community in building predictive models of depression using voice as a biomarker. We use data collected to extract features from voice samples we believe are markers for depression and hope to build cheaper, faster, more accessible, and reliable screening and treatment monitoring tests. ​We have partnered with schizophrenia.com, an internet community dedicated to providing high quality information, support and education to the family members, caregivers and individuals whose lives have been impacted by schizophrenia. They are dedicated to improving the lives of all individuals and families suffering from schizophrenia, and in speeding the research progress towards a cure. Toward this mission, we are partnering to collect data to fuel our search for a cheaper, faster, more accessible, and reliable screening and treatment monitoring test. The Emory Alzheimer’s Disease Research Center (ADRC) is one of 27 active centers in the nation supported by the National Institutes of Health. The goal of these centers is to bring scientists together to facilitate their research and help learn more about Alzheimer’s and related diseases. We are collaborating with Emory's ADRC to gather voice data across several cognitive studies to validate biomarkers extracted from voice against gold standard biomarkers. Since 1948, the Framingham Heart Study (FHS) has been committed to identifying the common factors or characteristics that contribute to cardiovascular disease (CVD) by following CVD development over a long period of time in three generations of participants. Over the years, careful monitoring of the Framingham Study population has led to the identification of major CVD risk factors, as well as valuable information on the effects of these factors such as blood pressure, blood triglyceride and cholesterol levels, age, gender, and psychosocial issues. Over time they have added monitoring of risk factors for other physiological conditions such as dementia. This has led to collection of a rich database of information reflecting how the brain ages. We are partnering with FHS to study how voice correlates with other markers of cognitive decline. The mobile closed-loop neurostimulation systems using wearable sensors that communicate between smartphones and implanted devices we are developing will provide a platform for investigations into the performance and viability of closed-loop DBS as a clinical tool. These mobile systems will be instrumental in expanding the understanding of the neurological basis of tremor by providing consistent data collection and patient monitoring. Elastic Stack is a powerful, open-source, distributed search engine providing full-text search. Kibana lets you visualize your Elastic Stack data. We are building powerful data visualization tools to accelerate discovery of digital biomarkers using Elastic Stack and Kibana, making data science more accessible and faster. ​The study of brain development is the single most important route to new and better diagnostic tools and treatments. That’s why the Child Mind Institute is leading an unprecedented initiative to collect imaging and clinical data from 10,000 young people —and share this de-identified data with the global scientific community to accelerate discovery. In the process, this community-based research program, the Healthy Brain Network, is providing mental health evaluations and follow-up resources at no cost to 10,000 children. Please visit here to learn more. In collaboration with the Child Minds Institute, Arno Klein leads as the Director of The Child Minds MATTER Lab, with their goal aiming to build and apply technologies such as wearable devices, smartphone apps, online tools, and voice and text analysis for children and adolescents to monitor and improve their mental health. The lab is part of the Child Mind Institute. Please visit here to learn more.